1) There will never be ties. 2) Each possible ordering of the players (determined by highest result, next highest result, etc) has a mathematically equal chance of occurring. 3) The above conditions hold for every subset of the whole set. There is some pretty sophisticated mathematics behind the design of this dice set invented by Eric Harshbarger, Robert Ford and James Ernest. Includes color instructions and a cloth storage bag. Sicherman dice are the only pair of dice marked only with positive integers that have the same probability distribution for rolling the numbers 2 through 12 as a standard pair of dice. They were discovered by Colonel George Sicherman and reported on by Martin Gardner in a 1978 article in Scientific American. The dice are labeled 1, 2, 2, 3, 3, 4 and 1, 3, 4, 5, 6, 8. Their uniqueness has been proven mathematically. 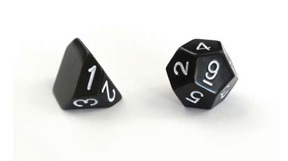 Rolling and summing this pair of dice yields the same 36 possible results as a pair of standard six-sided dice. 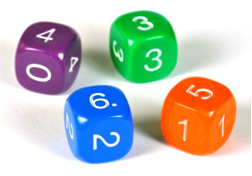 Sicherman dice are a well-known pair of six-sided dice marked with different integers from the standard d6 dice, but giving the same probability distribution for the pair. Recast 2d6 does the same trick, but adds an extra twist by using a d3 and a d12. Available in black or white; color choice can be specified in the shopping cart. 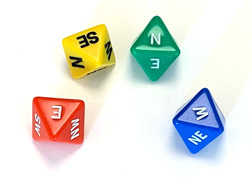 This version of non-transitive dice is based on a three-dice set. The first die beats the second in 25 out of 36 possibilities, the second beats the third in 21 out of 36 chances, and the third beats the first in 21 out of 36 tries. 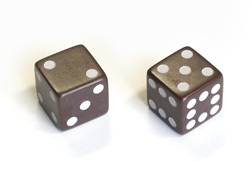 These dice work in a cycle, such that each die is beaten by another die 2/3 of the time. So no matter which die your "opponent" chooses, you can always choose a die that is likely to roll higher. This set was discovered by Stanford University statistician Bradley Efron. The four dice are numbered 0,0,4,4,4,4; 3,3,3,3,3,3; 2,2,2,2,6,6; and 1,1,1,5,5,5. 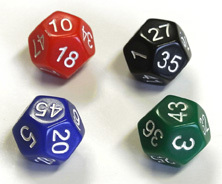 Non-transitive dice set discovered by Dr. James Grime of Cambridge University. This set has ten dice, two each of five different colors. With five dice, green tends to beat red, red tends to beat yellow, yellow tends to beat blue, and blue tends to beat purple. So you might think green is the best die and purple is the worst. But here's the twist: purple beats green, so there is no best! Even stranger, with two of each color, the order of which color beats which reverses direction. The dice are described in detail in this YouTube video: https://www.youtube.com/watch?v=u4XNL-uo520. The set of ten includes color instructions and a cloth bag. 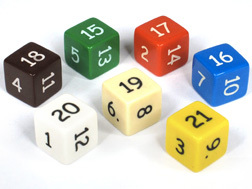 Non-transitive dice set discovered by Oskar van Deventer. 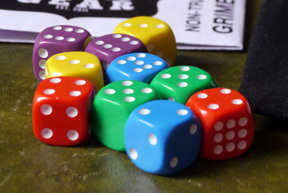 This set consists of seven dice, each one a different color. 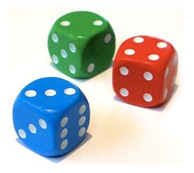 If two people select any two dice at random, a third die can be chosen that beats both of them. Oskar describes the dice in detail in this YouTube video: https://www.youtube.com/watch?v=LrIp6CKUlH8. Laser etched and hand inked. Includes a velvet bag for storage. 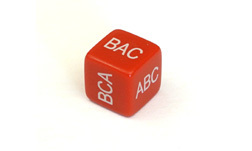 There are six different ways of permuting or ordering three objects A, B, and C: ABC, ACB, BAC, BCA, CAB, and CBA. This d6 allows you to randomly choose a permutation for three objects. Laser etched and hand inked. This eight-sided die has on its faces the compass points N, S, E, W, NE, NW, SE, and SW. Perfect when you're in the mood for a random walk! Available in blue or black.